Whole Foods Q2 earnings: Up up and away. Whole Foods had a stellar earnings announcement (PDF) yesterday evening announcing 8.5 percent identical-store sales growth and 13.6 percent overall sales growth. Strong growth was, to an extent, to be expected as the company had announced a deliberate strategy of lowering profit margins to try to expand sales outside their stereotyped high price “whole paycheck” niche. Except gross margins actually went up slightly. The reason for this is particularly interesting, because it suggests that in Whole Foods’ stronger markets its downscale competitors may be facing a real cycle of doom. Whole Foods didn’t raise prices. 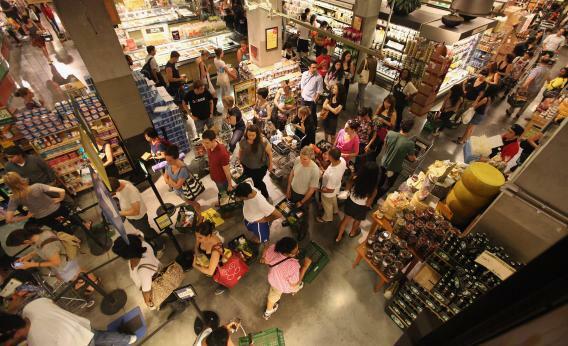 Instead, the improvement was “driven by an improvement in occupancy costs as a percentage of sales.” That’s to say that Whole Foods has a lot of fixed costs associated with keeping its stores open. So when more people shop, that not only improves sales it improves profit margins because now the fixed costs are spread across a larger number of items sold. And at least judging by the experience of the Whole Foods near my house, the company is very good at hiring cashiers who move the line quickly and effectively, so they have the ability to process tons of customers if the demand is there. The flipside of this is that if competitors lose business to Whole Foods, not only does their revenue decline but their margins go down too. And groceries are not a very high margin business. You can tip over the edge into a kind of death spiral where falling sales lead to falling margins which forces you to either raise prices or reduce the quality of the shopping experience. Traditional supermarkets in big cities are in particular trouble because not only is Whole Foods succeeding like gangbusters, Walmart has reached saturation in its traditional markets and is increasingly building urban format stores.